I don’t know about you, but my Twitter and Facebook feeds are overflowing with updates on how many schools, universities, and day care centers are closed today as the latest round of winter weather works its way up the East Coast. But some are open, with professors in the classroom trying to make headway on syllabi that are rapidly becoming useless as guides. I was one of those professors trying to run class this morning (until our university closed at 12:30). Teaching in such situations is something I find incredibly challenging. The students are all distracted, and on a campus with lots of commuters, that means the room is already half-empty. This morning everyone came in feeling wet and cold, watching out the window, and during my first section we lost a good ten minutes as the campus alert system cascaded across everyone’s computer and phone with a text, an email, and a phone call announcing the campus closing. When confronted with such a situation, I usually try to acknowledge the obvious (it’s snowing outside!) but ask the students to focus, which is to say that I start with something like, “yes, it’s snowing, but we’re all here anyway, so let’s work.” It helped at least today that we were covering relatively “fun” material, the Salem witch trials. But it’s always a challenge, especially when as a faculty member I wasn’t particularly thrilled to wake up and discover my campus among the few open. So as you’re home watching snow, ice, sleet, graupel, rain, or something else fall from the sky—hopefully with a cup of something warm in your hands and perhaps the Olympics on TV—I open it up for your thoughts: how do you deal with a weather-distracted classroom? In the fall semester I drew all the window shades in my classroom so students wouldn’t be distracted by snowfall during a final exam. I hadn’t thought about this before but it’s opportune since more snow is due and Yale almost NEVER cancels undergrad classes because they clear the campus pretty quickly. Of course, that doesn’t help faculty or TFs who live over a mile from campus and don’t drive. Therefore, any ideas readers might suggest would be helpful to me tomorrow (assuming I actually survive the walk to campus). I’ve not really had to deal with this yet, either, because whenever access to my campus is under threat, the university does a pretty good job of cancelling class. I guess the key question is how essential the material for the class session is in the broader sweep of the class. 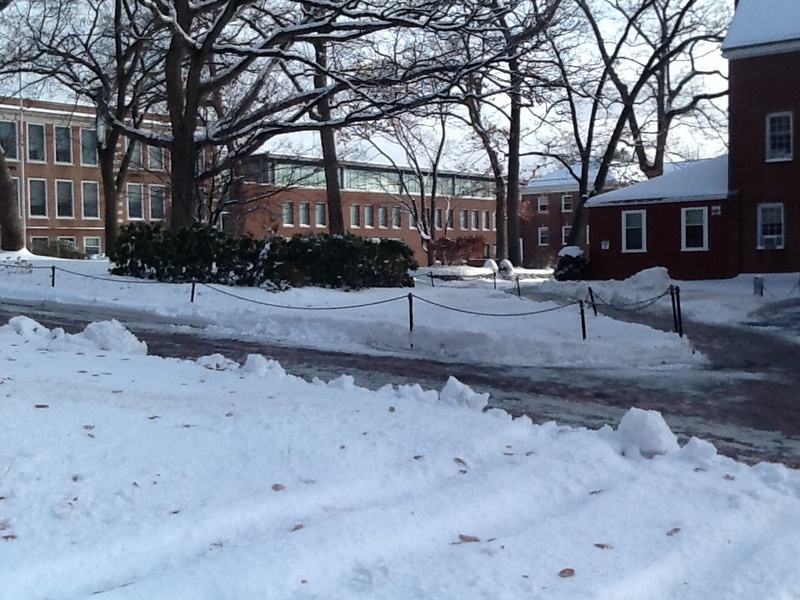 That is to say – if it were a snow day, you need to reorganize your readings for the remainder of the course anyway. Should you treat it as essentially a snow day, and run the half-empty class just as a review or lighter discussion of materials? I don’t know. So one problem that complicates things for me is the commuter factor – unlike Michael, half or so of my students drive to class, so I lose a large number when there’s weather. I’ve reorganized on several occasions or given up on a day when it was obvious nothing would happen (we had class the day of the Boston Marathon bomber lockdown … no learning took place that day). This time, I pushed through. We’ve had several snow days and cancellations already, so I just had to do it. Plus it was material the students could find engaging without being totally locked in. But it’s a debate for sure. I’ve used the opportunity to talk about what life would have been like for people in the particular time period we are talkin about when the weather was bad. We’ve talked about farmers worrying about crops and animals, about what enslaved people would have worked at in the winter months, and how you would have changed the patterns of your life to protect against the cold and snow. Many students take plows and reliable heat for granted, it’s good to give them some perspective.